Christ is Risen! But then what? The story continues of course, with more exciting details and events to engage our young listeners. Christ spends the next 40 days displaying His physical Resurrection. He appears in the upper room to the Apostles twice when the doors are sealed shut, granting them peace. He is seen along the road to Emmaus, but unrecognizable to Luke and Cleopa, until He breaks bread with them and is known essentially in the Eucharist (see the lesson plan here). 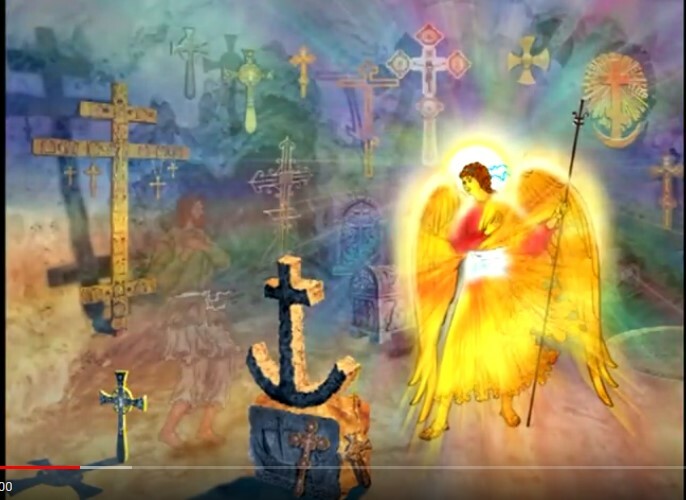 Then at the fortieth day on Mt Olivet the disciples with the Mother of God, stand in awe as Christ is taken up before their own very eyes into the sky with the angels at His side on His return to the Father (The Ascension). What could possibly come next for the followers of Christ.....they must wait ten more days! 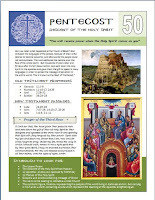 Be sure to connect for your young people the Old Testament story of the Tower of Babel. They'll probably remember well that God "mixed up" the languages to stop the wicked plans of the people. Now, in the story of Pentecost, God is doing the opposite. He sent the gift of languages, for this one time purpose, to spread the good plan of His salvation to the whole world. ..."Grant to my thoughts the Spirit of your wisdom, to my folly the Spirit of understanding, with the Spirit of your fear overshadow my deeds. Renew a right Spirit within my inward parts and make firm the instability of my mind with the sovereign Spirit, so that guided each day by your good Spirit to what is profitable, I may be found worthy to do your commandments and always keep in mind your Coming, which searches out all that we have done..."
Thanks for sharing this Pentecost lesson. I have found lately that even though I am a fluent Greek speaker, I don;t get the full efffect of a lot of the prayers. When I hear them in English or read them, they click more for me. Have a great day! Thanks for sharing this post, really I learn something new with your post. Nice blog and keep posting this type of informative post. This is something that my brother would love to hear about. He has his son enrolled in a Christian school and this is some valuable information for him. He will really like learning something like this for his son.